The Mahindra XUV500 Petrol AT is on sale in India at a price of Rs. 15.63 lakhs (ex-Delhi). • Available in a single trim. You'll miss the 6 airbags, sunroof, reversing camera, AWD etc. This review has been jointly compiled with Aditya. Thanks to him for the expert observations! Last edited by GTO : 28th March 2018 at 13:41. Last edited by GTO : 28th March 2018 at 13:39. 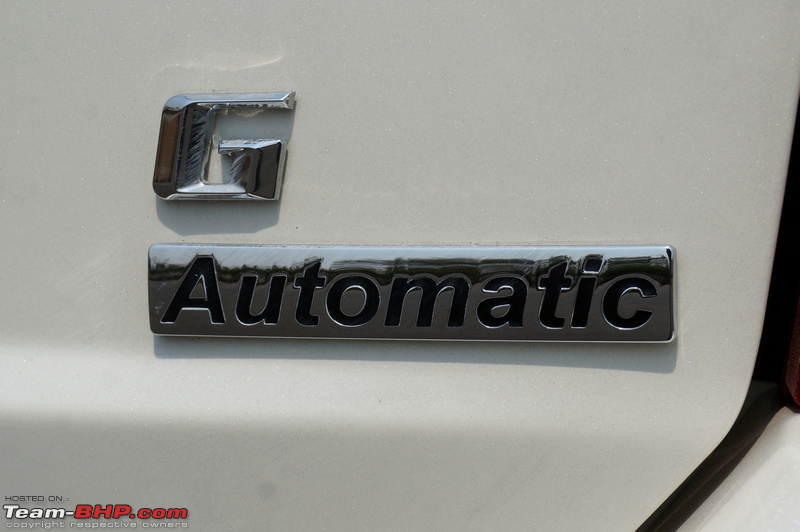 Traditionally, large SUVs powered by petrol motors have never really clicked in India. 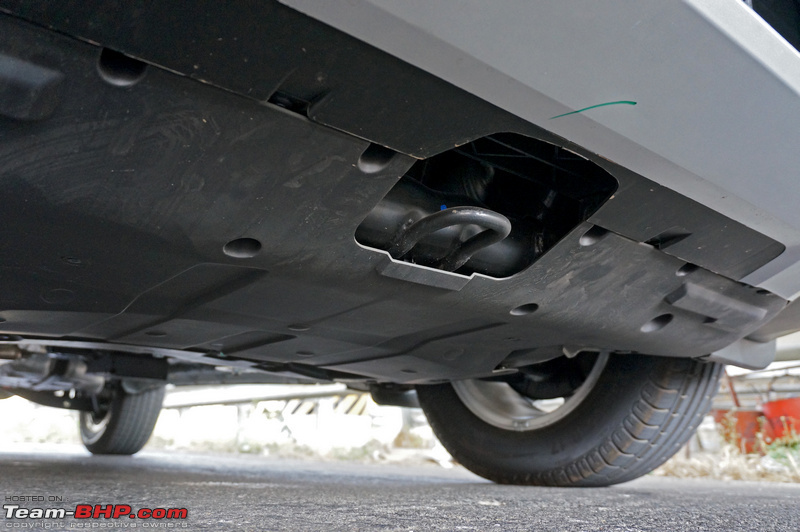 Lighter monocoque petrol SUVs do sell (e.g. Creta), but large + heavy SUVs powered by big petrols never found customers because they are petrol guzzlers. 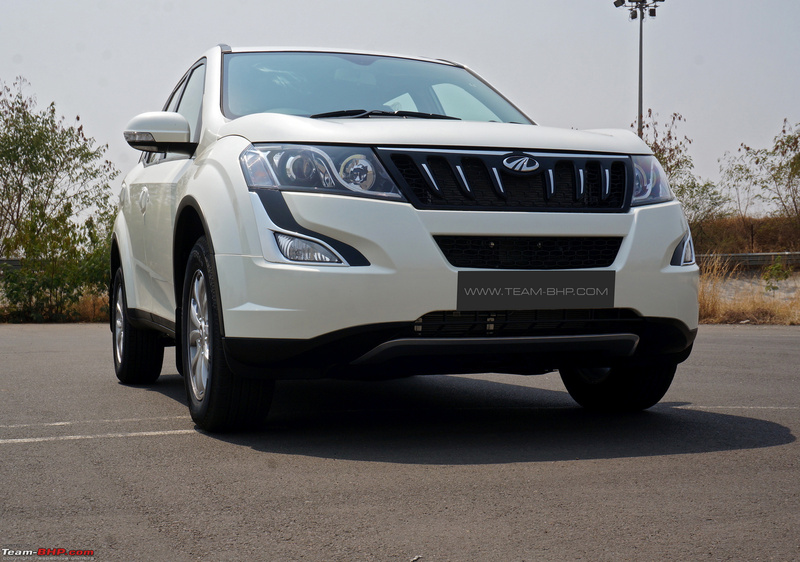 Even though the XUV500 is a monocoque, it is still a heavy SUV. 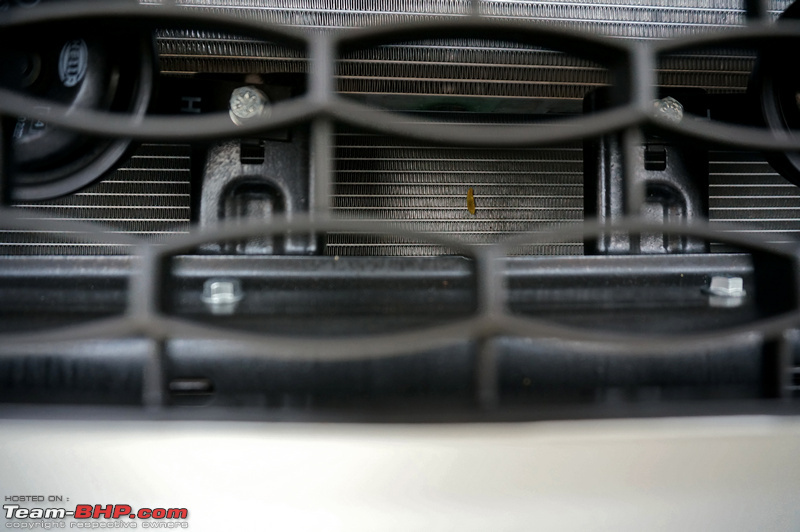 While Mahindra hasn’t shared the exact kerb weight of the car, we expect it to be similar to the diesel due to the engine block, gearbox and equipment being the same. 1. North India makes for India's biggest car market. In Delhi, diesel cars now have their RC books valid only for 10 years. Hence, many customers are moving to petrols in a big way (see this customer example). 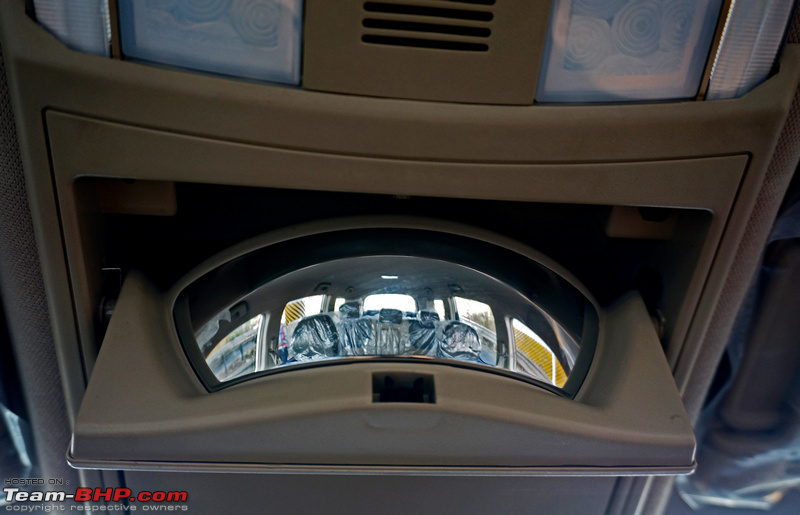 It is the reason that the Innova & Fortuner both have gotten petrol-guzzlers under the hood. Delhi-NCR had also completely banned the sale of cars powered by 2+ liter diesel engines for a short while. 2. Exports. 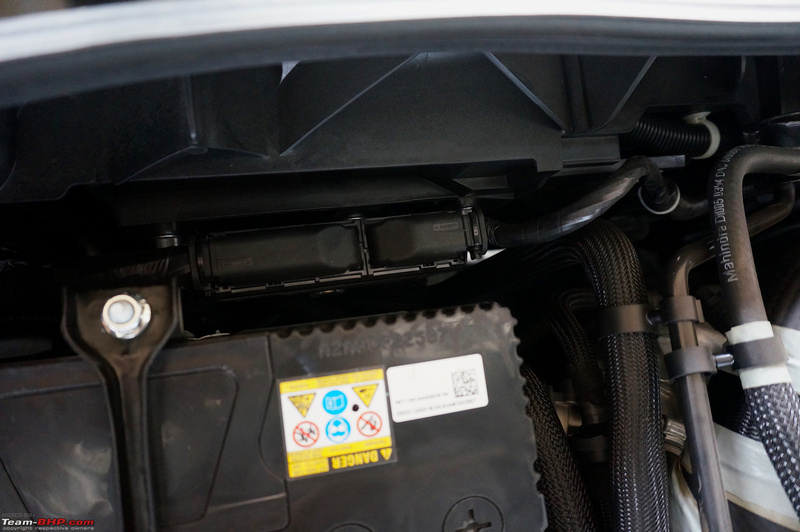 Don't forget where the XUV500's petrol engine was first spotted - link to thread. 3. Even outside of Delhi-NCR, there is a certain customer who will buy petrol cars only as he doesn't like the diesel's clatter and / or his running is on the lower side. 4. 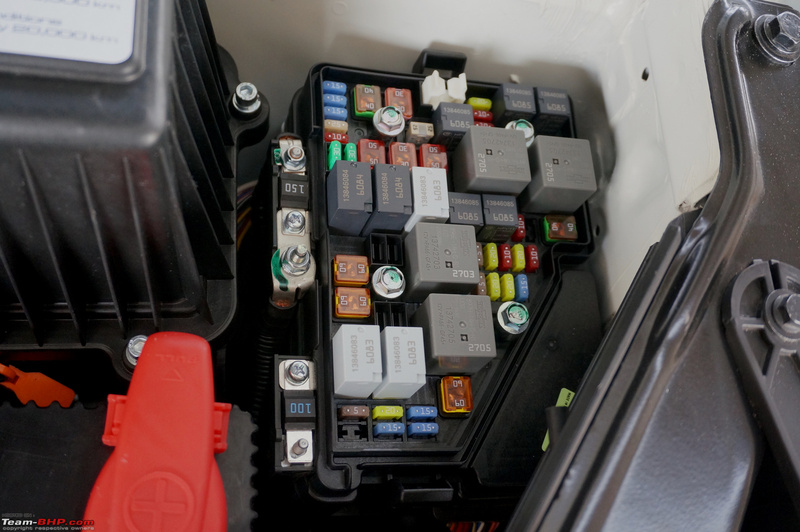 It's a cost-effective way for Mahindra - traditionally a diesel expert - to fine tune its petrol engine capabilities. 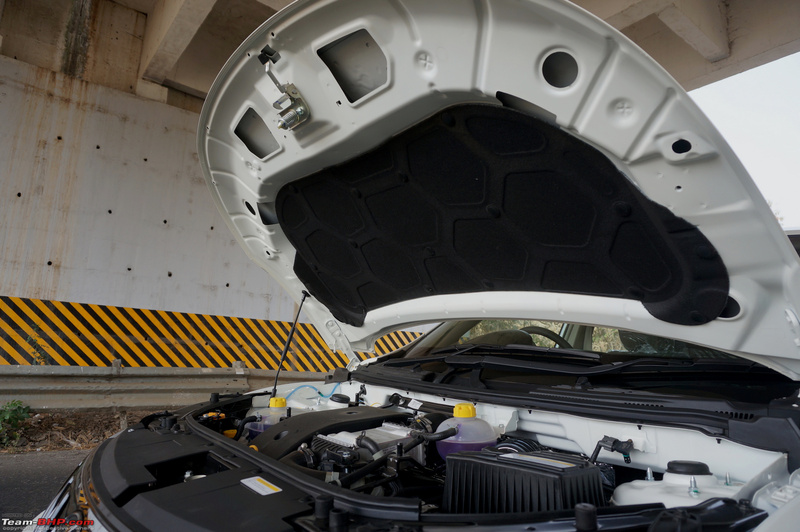 Because there is so much shared with the XUV500 diesel (including the engine block), this will be a cheap exercise with minimal risks. The R&D cost would be as small as a rounding error in Mahindra's financial statements! Be in no doubt that Mahindra is going to have to sharpen its petrol-engine expertise due to market trends. 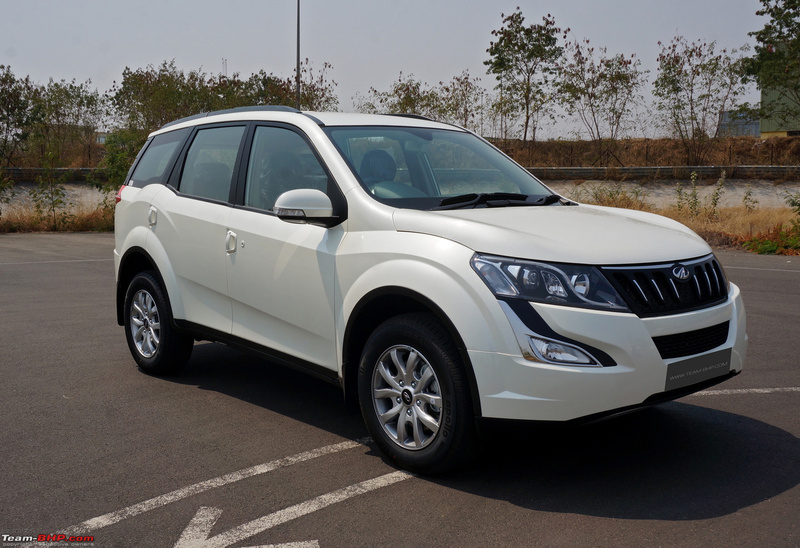 Mahindra has launched the XUV500 petrol in just one variant called the 'G Automatic'. It is based on the W9 variant, but misses out on features such as the sunroof and reversing camera. Comparing it with the W9 AT, the petrol model is cheaper by Rs. 1.04 lakh (difference is actually ~60k if you account for the sunroof + reversing camera). Look at the chart below & notice how similar the power & torque figures are to the diesel! Perhaps the only car we've officially reviewed where the petrol & diesel engines had so much in common. The place where the camera used to be housed is now covered with a blank! Why Mahindra? Especially when there is only one petrol model in the line-up. In a large SUV, the rear view camera is a must for easier as well as safer parking. 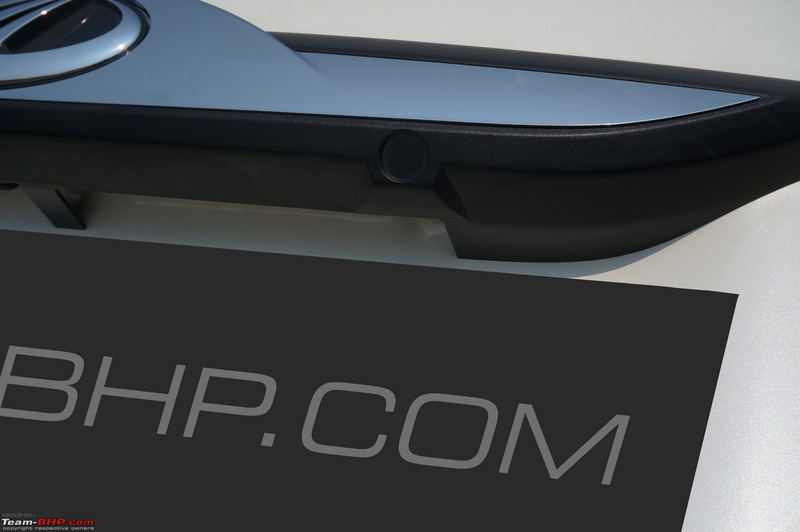 Far cheaper hatchbacks get a reversing camera as standard today! ...even the redline is marked from 5,000 rpm! ...the dead pedal really needs to be wider, especially in the AT where it will be used 100% of the time. Anyone with even a size 10 shoe will find it to be too narrow. Doesn't support the entire foot. 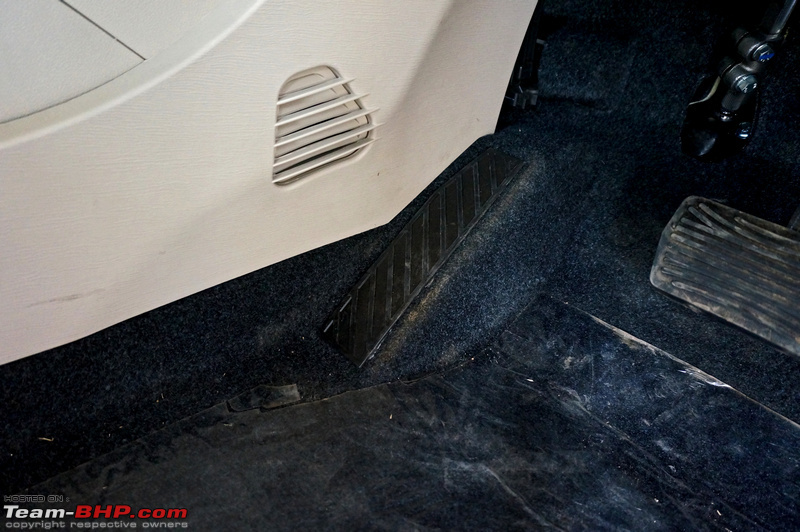 Now that there's so much space in the footwell, why didn't Mahindra think of this? Last edited by GTO : 28th March 2018 at 13:38. 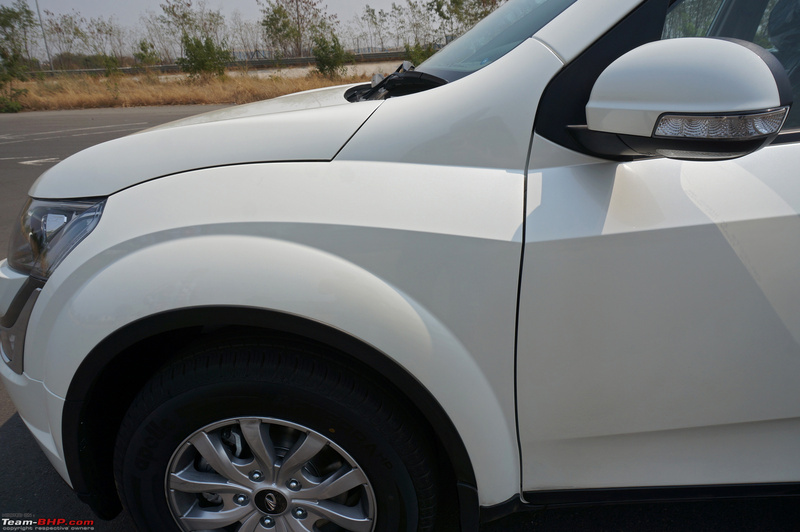 A note before starting the engine post - we've driven the petrol variant only on Mahindra's test track @ Chakan, MH. We drove it for just under 2 hours; that's enough for initial impressions, but don't treat this as a full-fledged engine review. 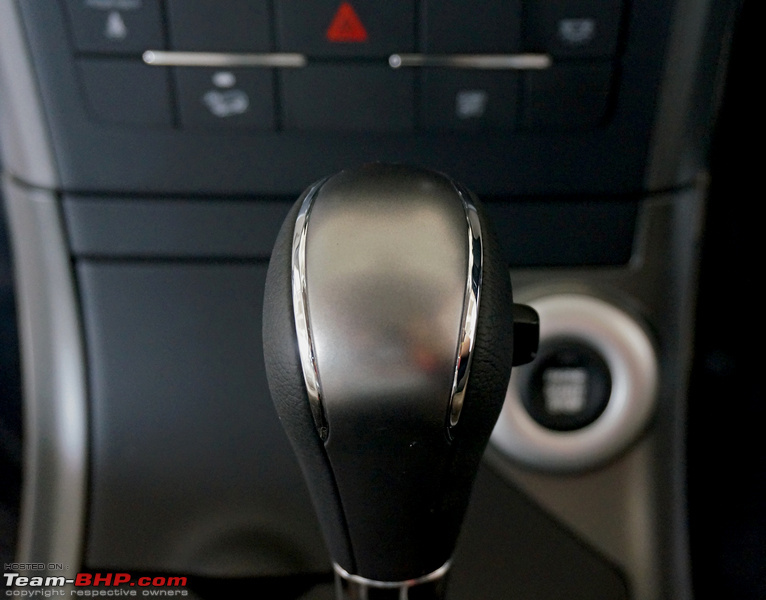 The same 6-speed AT (imported from Japan's Aisin Seiki) of the XUV500 Diesel has been used here. No fancy dual-clutch tech - it's a conventional torque-converter unit and, I must say, superbly mated to the petrol. 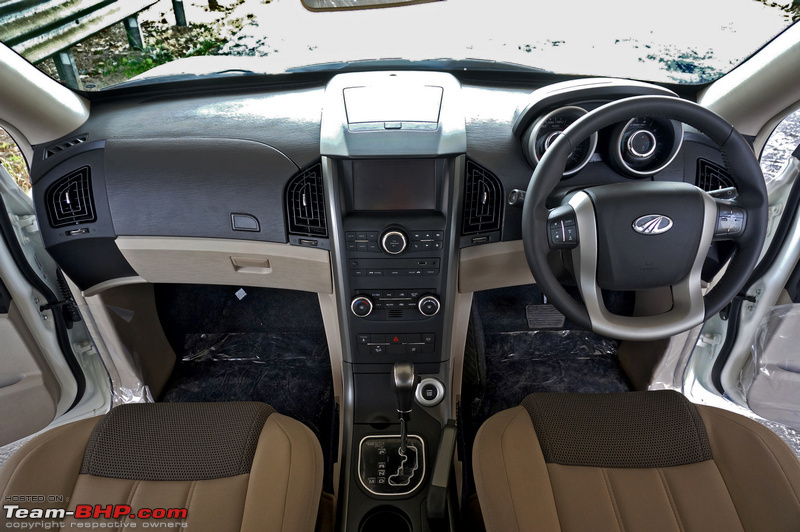 We'd commented on similar lines in our XUV500 Diesel AT review as well, and it's obvious that Mahindra has been polishing up its AT-tuning skills. The engine starts off in 'P' & 'N' only (no body shake while starting). Try pressing the start button in any other gear position and the motor won't fire, with no display prompt coming up on the MID telling you to switch to 'P' or 'N'! A missing safety feature = the brake pedal doesn't need to be pressed to fire up the SUV, although you do need to press the pedal to move the lever out of 'Park'. Not applicable to 'N' though - in fact, you can freely slide the gear lever between 'N' & 'D' even at 60 km/h (remember, there's no unlock button on the gear lever)! 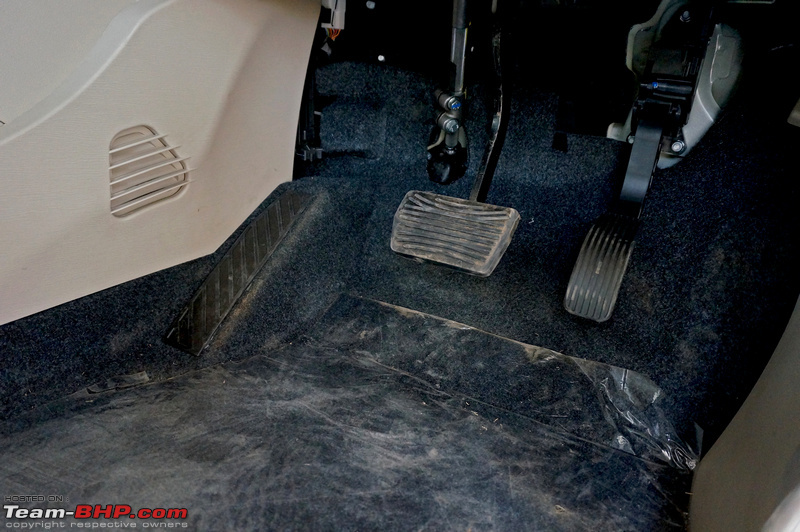 Take your foot off the brake pedal and the XUV500 AT will crawl forward at a speed of ~7 km/h. This crawling is useful as you can conveniently drive in bumper-to-bumper traffic with just one pedal (the brake). 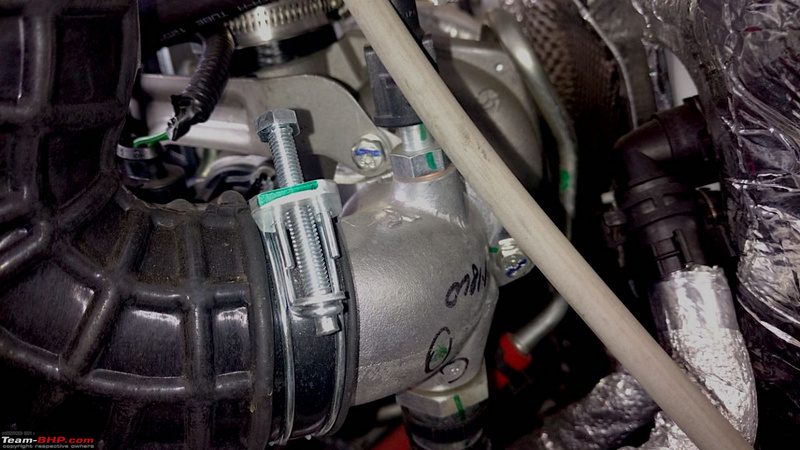 As is the case with torque converter ATs, accelerating off from a standstill is smooth & seamless. Throttle response is good and, thanks to the 320 Nm of torque (just 10 Nm less than the diesel), there is no sluggishness felt. This driveability makes it practical. Move calmly with a light foot in the city and you'll notice that the conservative gearbox is eager to move up; these early shifts keep engine noise to a bare minimum in the city. The upshift quality is very smooth too - it's devoid of any jerkiness and the change in engine note is the only hint of a gear change. 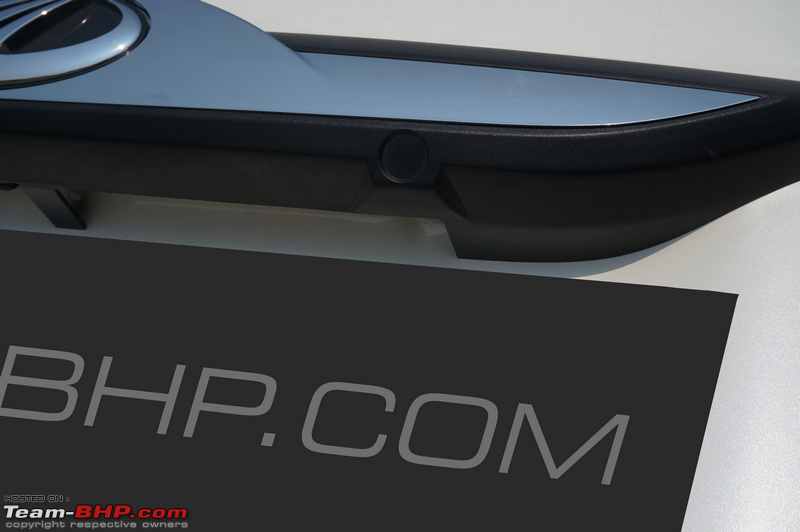 Throttle response is satisfactory even on the move and you'll easily make your way around the city. 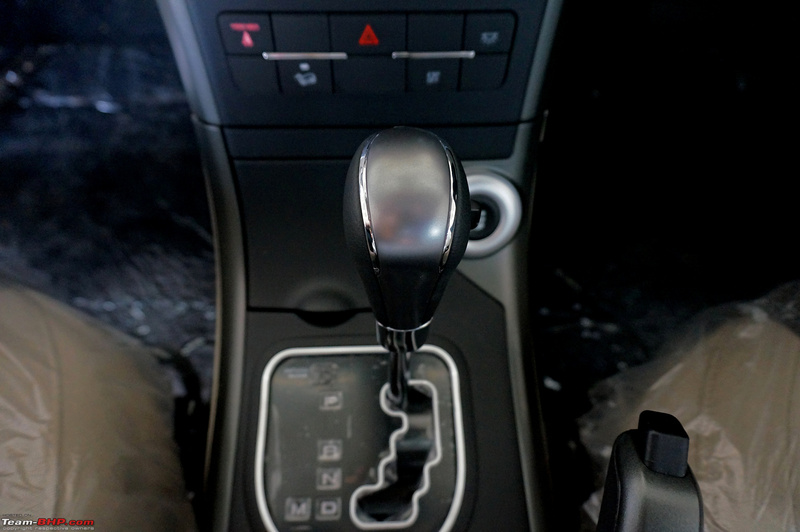 Press the A-pedal hard in the initial lot of gears and you'll experience healthy acceleration. It's not a revv-happy motor though - in fact, by petrol standards, it's not revv-happy at all! Further, keep the accelerator pinned and she'll change gears at just ~4,500 rpm. 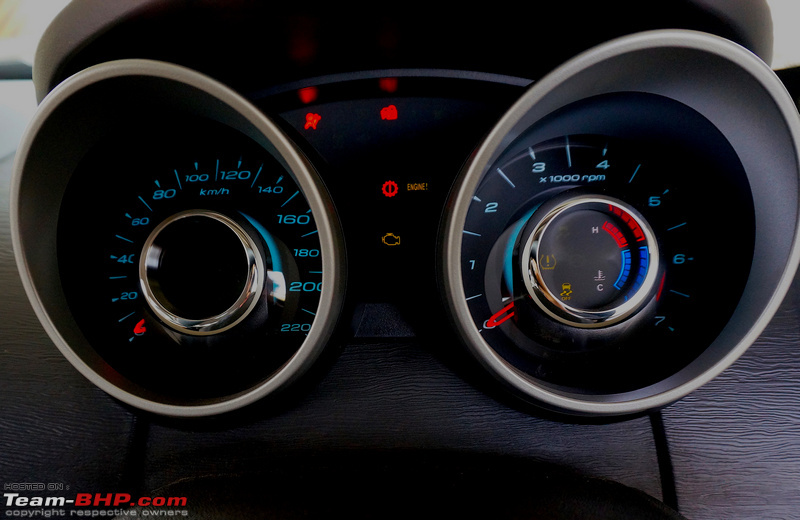 No matter what we tried, we weren't able to take the rev counter over 4,800 rpm. That's similar to the XUV500 Diesel and makes this the lowest revving petrol we've driven in India. The Petrol AT is effortless to drive in most situations. The AT accelerates clean to 120 km/h and could drive at three digit speeds all day long on the expressway. The tall 6th gear ratio makes for relaxed mile munching - 100 km/h is seen at merely 1,700 rpm and 120 km/h at ~2,000 rpm (identical to its diesel AT sibling). This calm cruisability, along with the composed ride quality + high-speed stability + cruise control, makes the XUV500 an excellent highway companion (fuel efficiency aside). The kickdown response time while overtaking is acceptable as well. That said, on single-lane highways or in aggressive overtaking moves, its best to use M-mode & get to the right gear before you move out. Reason? Sometimes, the gearbox will drop one gear when you expect it to drop two. Plus, the petrol also makes peak torque at a higher rpm than the diesel, thus it can take a second or over before you get the move on. 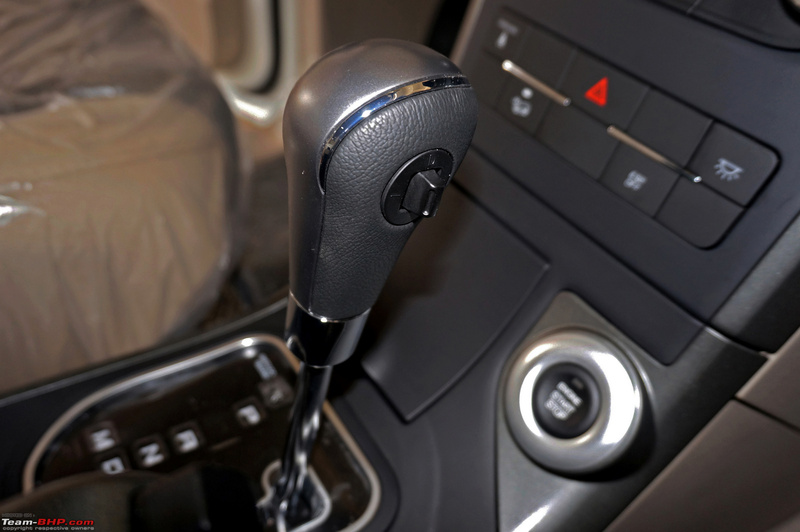 To engage manual mode, you have to move the gear lever to the left and slide the toggle switch forward for upshifts / backward for downshifts. The shift button is too small & very unergonomic to operate. Due to the placement of the gear lever in manual mode with regard to the tall armrest, using the shifter toggle is quite wrist straining. 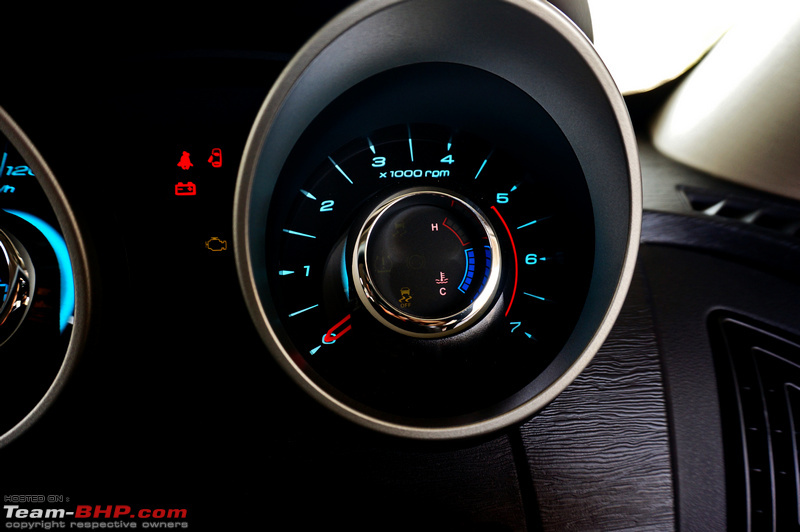 Moving the entire gear lever up or down (like the Compass) or paddle-shifters would be a far better option. Good news is, the XUV500's AT does a good job in most conditions and you'll seldom need to use manual mode. The only two driving conditions are when you want additional engine braking or if you're overtaking on a two-lane highway. Note: hitting the manual mode toggle switch with the lever in 'D' yields no response - you have to shift the lever to the left. 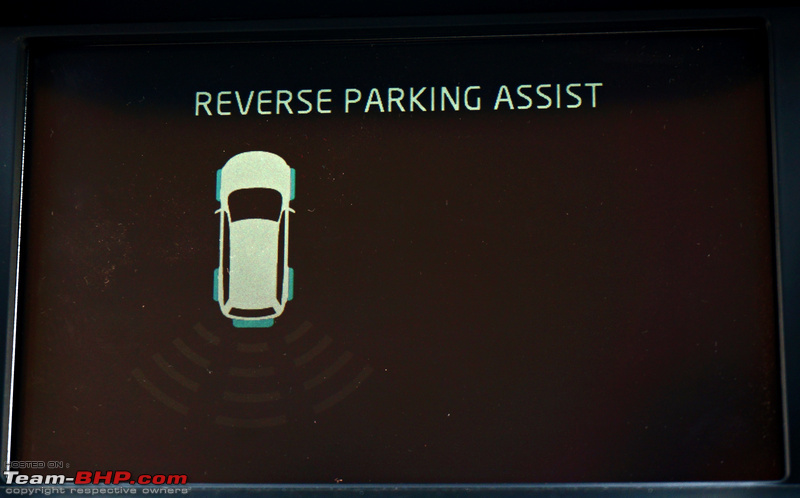 Once the purpose is fulfilled, be sure to slot the gear back into 'D' mode as there is no kickdown in "M" mode, and it will only upshift when the revs get too high. Basically, in "M" mode, the gearbox keeps waiting for your command. Lastly, unlike some other ATs we've driven, the car will not hold onto a gear at the redline in M mode (it'll upshift). 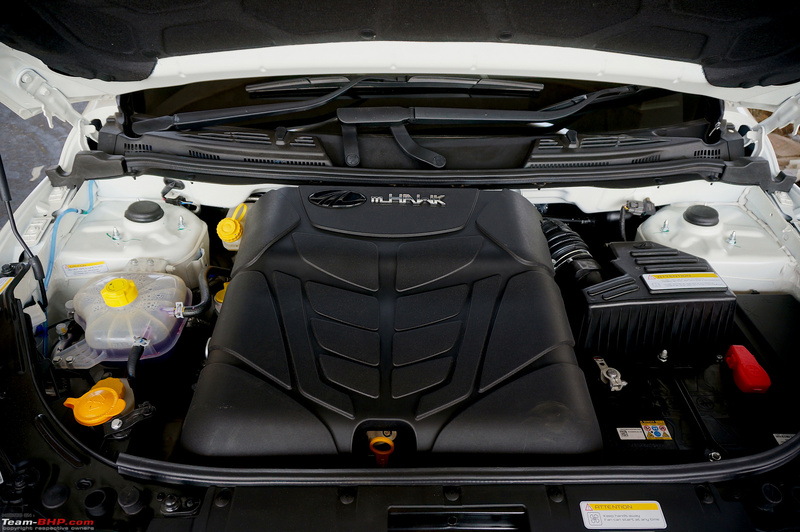 In terms of NVH, the XUV500 Petrol is superior to the diesel. The engine starts getting audible only after 3,000 rpm. It's still okay at 4,000 rpm, but post that, the motor gets gruff (unexpected from a petrol). In our test car, there was also some rattling noise from the front left side of the car (from the engine bay). What Mahindra has done is provide us the smooth, drivable nature of the diesel minus the noise & inherent vibrations of an oil-burner. That said, by petrol engine standards, the NVH is average. It's no Honda or Hyundai. A good thing that Mahindra has improved the XUV500's brakes over the years. After all, the AT needs competent braking hardware. The all-round disc brakes offer sufficient stopping performance with no nervous moments. Although, like the MT variant, nosedive under braking is present. In all other areas of on-road behaviour (ride quality, handling etc. ), the XUV500 AT is just as talented as its MT sibling. One major downside (and the biggest for most people) will be the petrol's fuel-efficiency. Simply put, it will be a petrol guzzler; Mahindra hasn't even shared its ARAI rating . 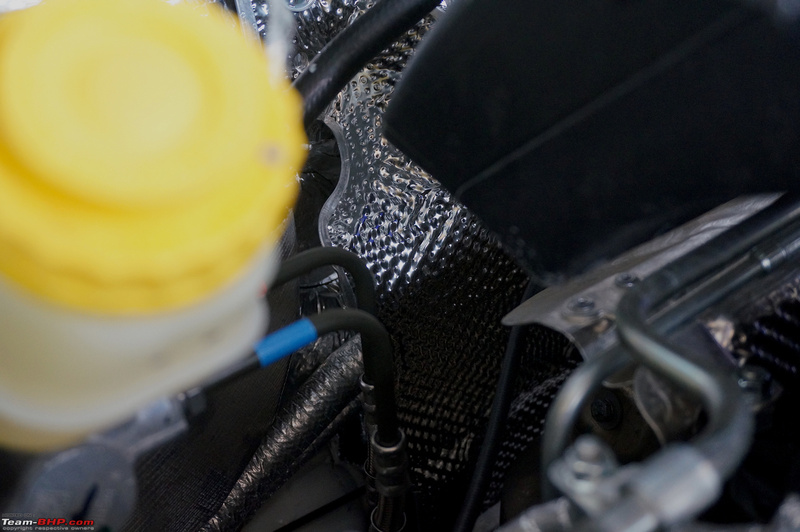 The big engine, hefty kerb weight and torque converter AT will together ensure that FE remains in the single digits. We expect it to give anywhere between 6 - 7 kmpl in the city (5 if you have a happy right foot). IMHO, if you absolutely must have a petrol, then go for this engine. If not, pick the very competent diesel instead. The diesel is quick, more economical, you get a wider variant choice and it will enjoy far stronger resale. Big, petrol UVs have always tanked in the used market and it takes a lot of time finding a buyer as well. Full bonnet cladding for the petrol too! 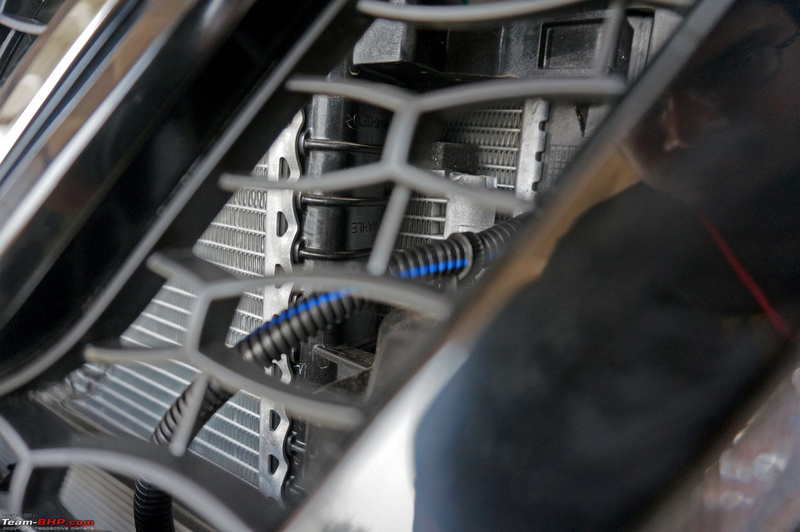 The intercooler has a separate coolant reservoir! Last edited by GTO : 28th March 2018 at 13:37. 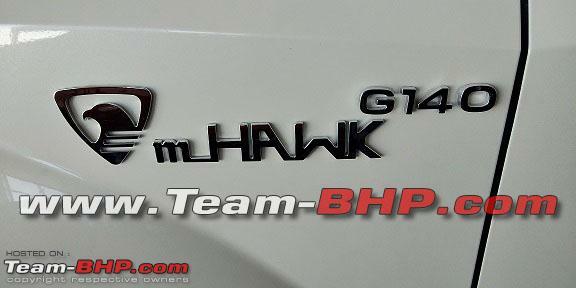 • Team-BHP was the first to show you the petrol engine's pics - (link to thread). • Take that extended warranty! This is a new engine from Mahindra and we expect to see niggles in the initial lot. It is usually the case (remember TUV300 threads?). 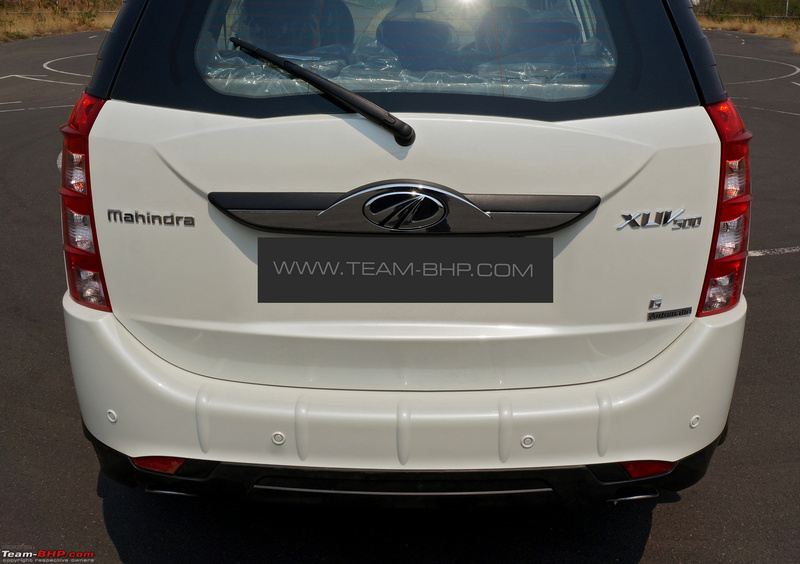 • While the Indian version gets only the FWD + AT combo, the export model gets FWD + MT as well as AWD + AT. • Can't blame Mahindra for not offering the Petrol MT here. Premium car customers love their ATs only. • If you want a Petrol AT with 3 seat rows, the XUV500, Innova Crysta & BR-V are your only options. Of course, the Ertiga & Fortuner are there too, but they are below & above this category (respectively); the former is less spacious, while the latter is way more expensive. 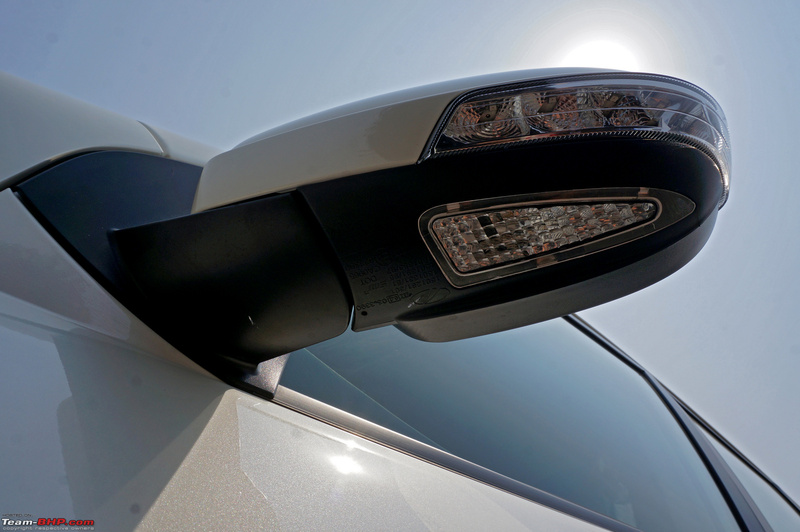 • Available in all the existing XUV500 colours - Sunset Orange, Pearl White, Opulent Purple, Volcano Black, Lakeside Brown, Coral Red, Dolphin Grey and Moondust Silver. • Service interval of 10,000 km / 1 year (same as its diesel sibling). On the flip side, you'll surely feel the downshifts when coasting or slowing down with very light braking. This is felt all the more when the gearbox is shifting to lower gears (e.g. to 3rd). No, it isn't noticeable when you are slowing down with the brake pedal pressed properly, and is felt mainly while coasting. The gear engaging action in these downshifts should have been less aggressive. Last edited by GTO : 28th March 2018 at 13:36. Thread moved from the Assembly Line to Official Reviews. Thanks for sharing! Rating thread a full 5 stars . 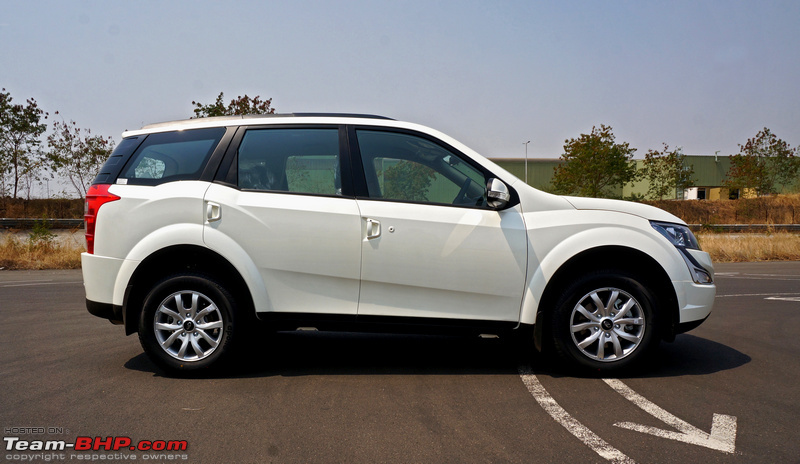 Despite the newer competition, I still love the XUV500 and think it's a fantastic all-rounder. If I was in the market, it would be a tough pick between the XUV500 and Hexa. That said, I would undoubtedly go for the diesel motor. 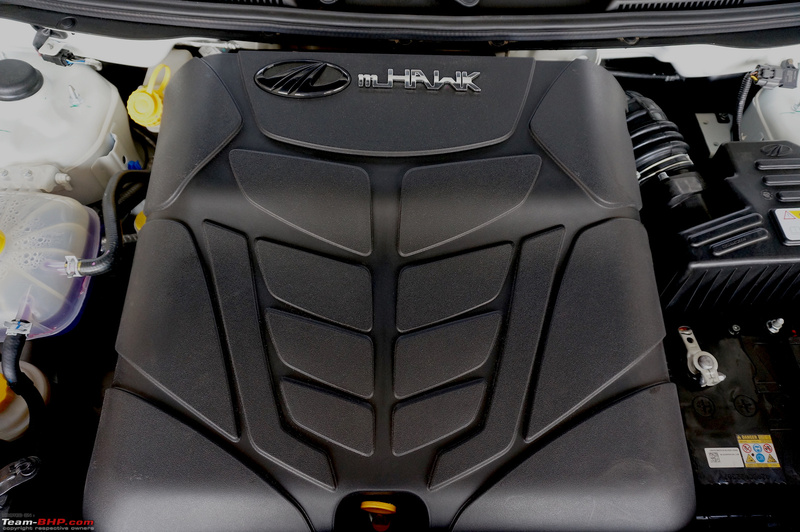 Mahindra's mHawk diesel is brilliant & seems to offer it all - power, driveability, economy & acceptable NVH. Even with the diesel, the AT is so well matched. 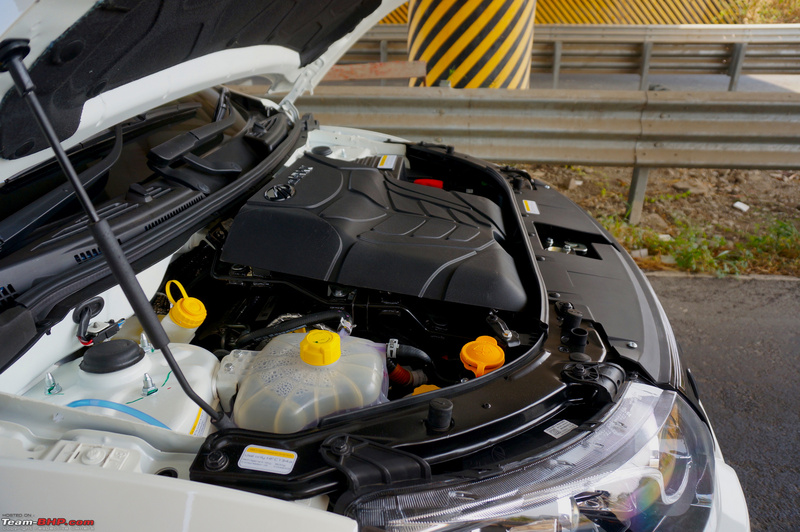 If I absolutely wanted a petrol, I'd anyday buy the Innova Petrol AT over this, as you yourself told me (our review of that 2.7L engine in the Fortuner is here). 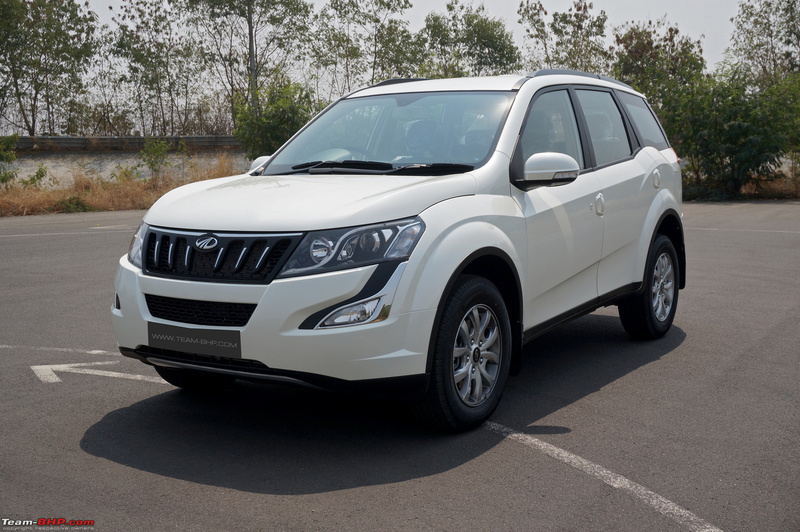 With the petrol, Mahindra is expanding the XUV500's appeal - this model is primarily for exports, yes, but it will help a wee bit here too (petrol lovers, Delhi diesel bans etc.). Last edited by GTO : 28th March 2018 at 17:31. Nice and crisp Review, Thanks for sharing. 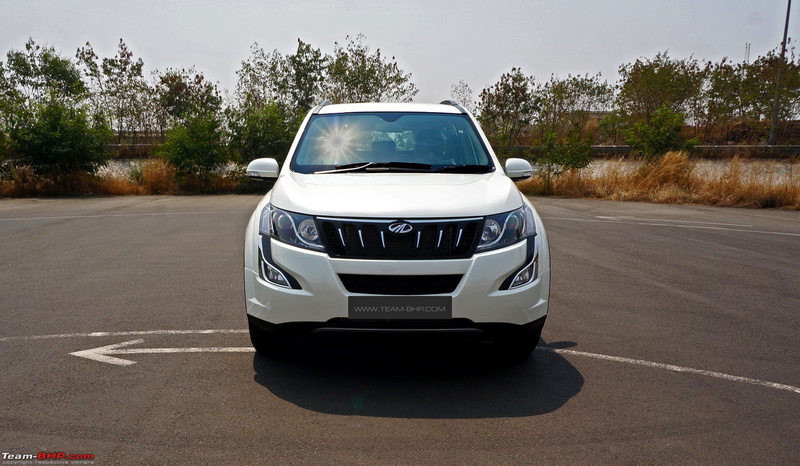 Despite the newer competition, I still love the XUV500 and think it's a fantastic all-rounder. 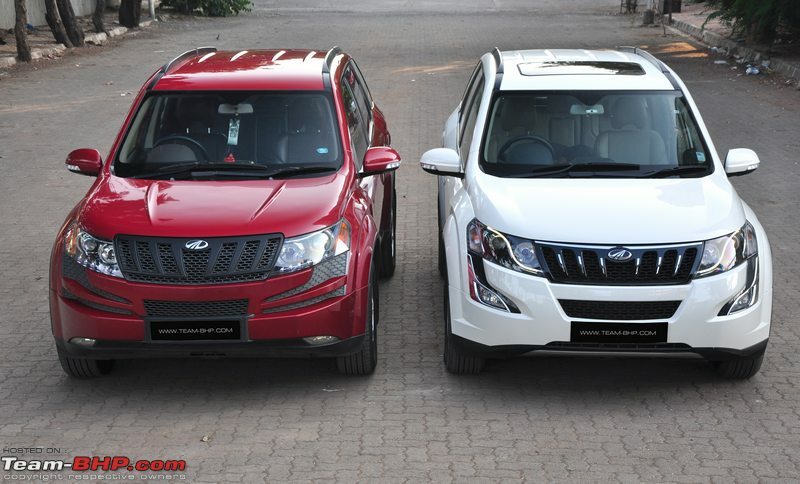 If I was in the market, it would be a tough pick between the XUV500 and Hexa. True, Petrol XUV sales will mostly happen in Delhi NCR and export markets. I don't see any significant market for it anywhere else. Hope Mahindra have ironed out the niggles (of the new engine) before it reaches the customers. If there ever was a diesel-petrol engine, this is it. Honestly, I’m disappointed. Mahindra here has taken the shortcut way. 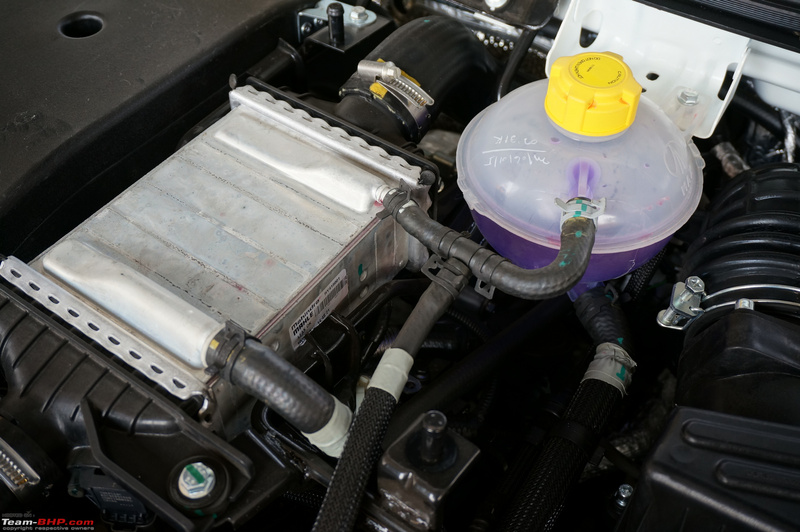 Instead of going the proper R&D way of developing a new turbo-petrol, as indicated by the reviewer, they have merely converted a diesel motor into a petroleum guzzling one. Shame. They should’ve developed a petrol motor from the ground up as it’s getting evident day by day, there’s no future for diesel motors. In an ideal world, I would’ve preferred if this was a hybrid motor. Get the first mover advantage; it’s not like they don’t have funds or access to electric technology. And then I would’ve applauded Anand Mahindra. Till then it’s just damp squib. Oh and a nice, concise review. 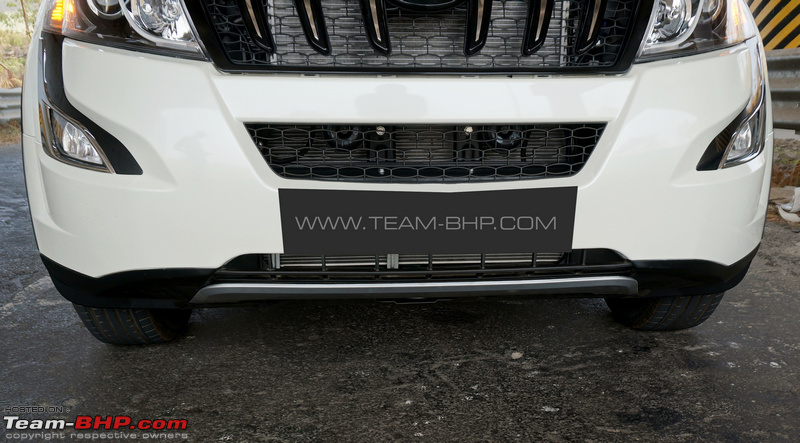 Definitely matches the standards of a benchmark Team-BHP official review despite the relatively less volume. Last edited by The Brutailer : 28th March 2018 at 23:14. 138 or so horses from a 2.2l IC turbo is really low considering a tiny 1.4l found in the Jeep pushes out a bit more. However; torque is good so might compensate for the lack of outright power. I do see some takers for this car. 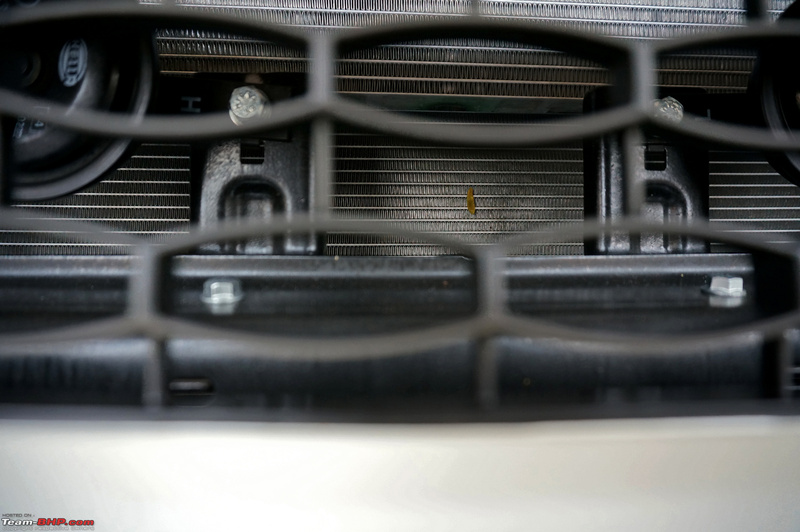 Low city runners, the occasional highway run, someone who wants the convenience of an automatic and space of an SUV but does not want an oil burner. A water cooled IC was probably a good idea considering our conditions. I am not sure if Mahindra will gamble with building a new petrol engine from the ground up unless it can serve multiple products. 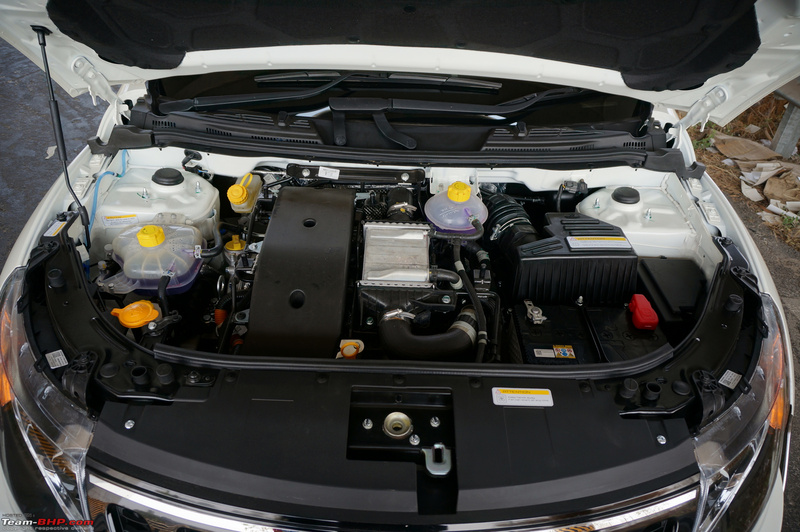 TATA have made headway here with small petrol engines. I guess it will be a wait and watch scenario of the government will do on pollution norms. Worst case, TATA and Mahindra will go back to AVL to build them petrol engines. It is what they did for the diesels anyway. Another great review by blackwasp. Mahindra should think of petrol variant at per with w10 AT AWD. Apart from big SUV( street presence) and petrol AT, I am unable to see much advantages barring what has been pointed out already. It will be interesting to see the sales figure for coming one/two years. 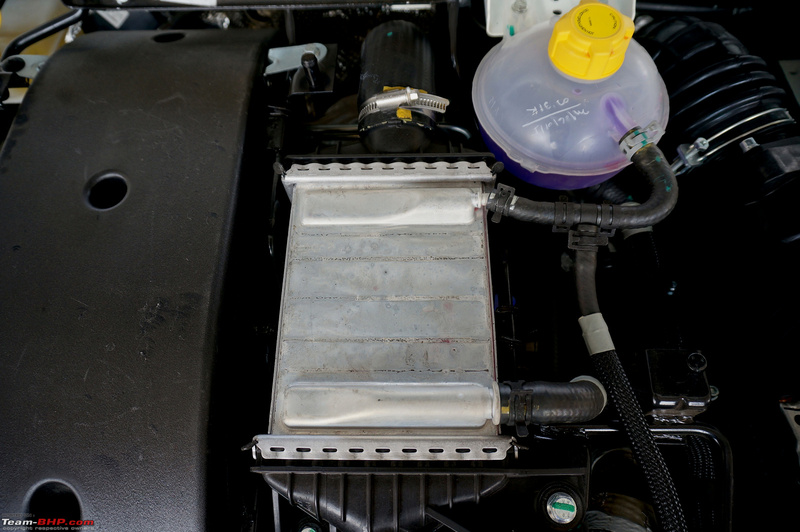 A petrol which makes the same power and torque as the diesel and revs the same with worse fuel efficiency. No thank you. P.S. And that engine cover is as cheesy as they come. 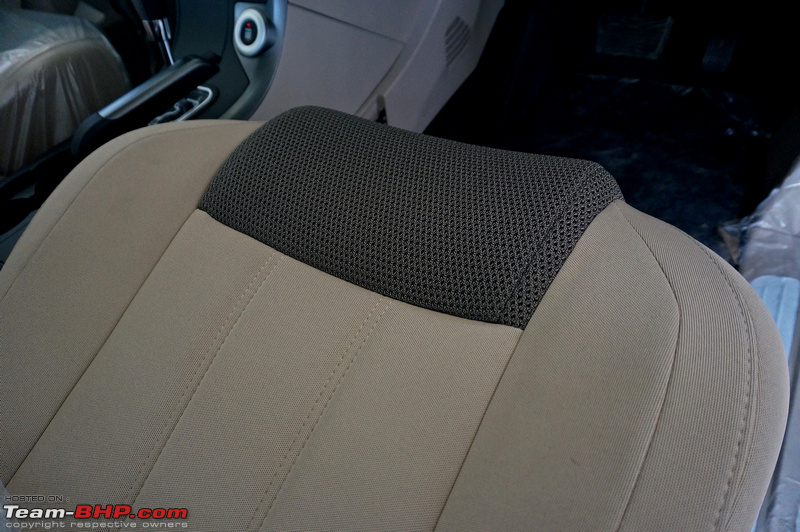 Mahindra does not know subtle. Last edited by extreme_torque : 29th March 2018 at 08:28. Once again a great review! As was discussed in several other threads, building a Petrol Engine from remnants of a diesel plant, will lead to half baked results. On a side note, just 3-4 comments to the review in 24 hours implies that there is no interest of Bhpians in this product. I am amazed that Mahindra managed to change the fuel used in the XUV but kept everything else about the engine very similar to the diesel. 138bhp from a 2.2L turbo petrol? Seriously? Anyways glad to hear that it is not that bad in performance. But they should have tried to put more effort to make a proper Petrol engine with more horses and also a revv counter that says the truth. With a 2.2L turbo petrol that revvs up to say at least 6000rpm they could have made a beast with at least 250bhp and it probably would give a similar or better efficiency. Missed opportunity for Mahindra. 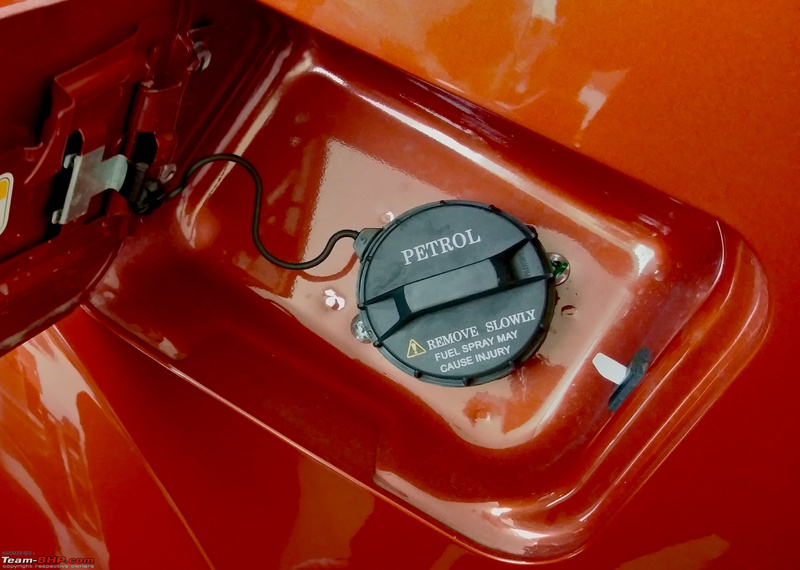 Also it looks like the fuel cap used here is the exact same one in my Tiago. Last edited by Sam_GTR : 29th March 2018 at 22:12. I think there is big time lack in planning with Mahindra. 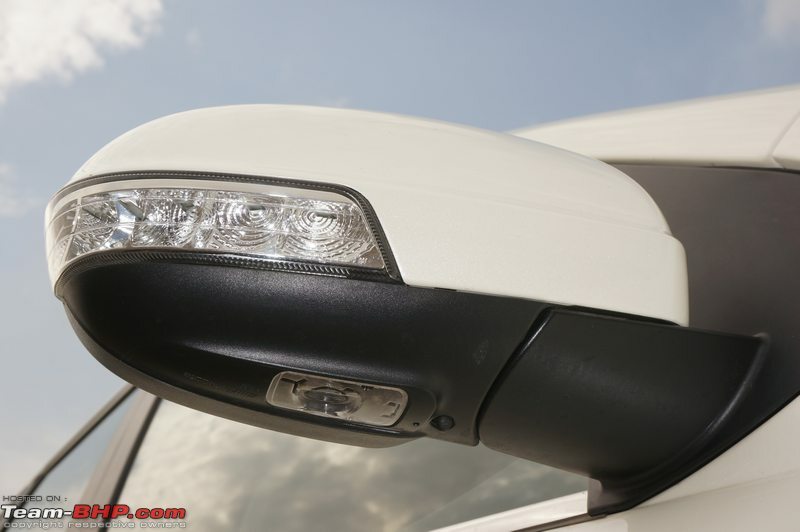 They have launched this petrol XUV recently and within few days they are launching the refreshed XUV. 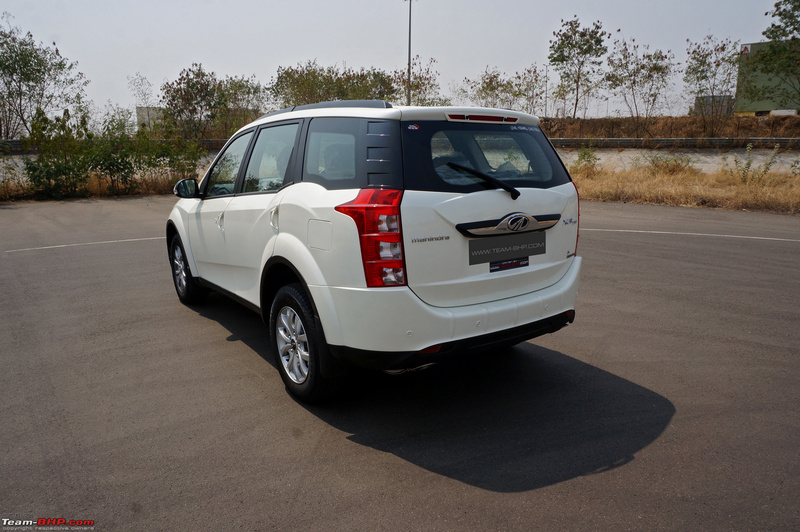 So the question is will petrol XUV be available in the refreshed avatar or the previous gen in which it was launched. First of all petrol SUV's dont sell in India and with current petrol prices it has become more difficult and if they launch it in previous gen, I dont see any takers for it, it's dead on arrival surely. All times are GMT +5.5. The time now is 14:06.